Sakai Guides and DocumentationSakai Basics Site InfoHow do I rearrange or rename the items in the Tool Menu? The Tool Menu can be customized by the instructor of the course to modify the order or appearance of menu items in the site. Tools can be renamed, hidden from students, locked, or deleted. Click Tool Order from Site Info tabs. Drag and Drop items to rearrange the tool order. Drag and drop tools to rearrange the order of tools in the menu. Click the Sort Alphabetically button at the bottom of the page to arrange all of the tools in alphabetical order by title. Click the gear icon to go to the tool settings. Then, select Edit Tool Title from the drop-down menu. In this example, the Sakai tool was renamed as Sakai Project Website. Click the green check mark to save your changes. Hide a tool from students. 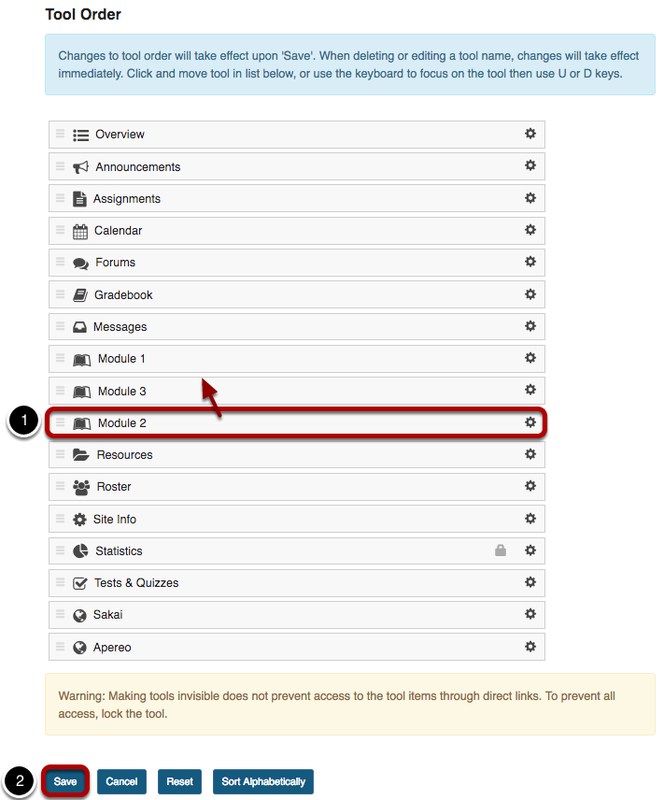 Hiding a tool from students allows them to access the tool from other areas of the site, but they do not see it listed in the Tool Menu. Click the gear icon to go to the tool settings. Then, select Make Tool Invisible to Students from the drop-down menu. Invisible tools are indicated by a "hidden" icon in the menu. In this example, the Resources tool is hidden from students. 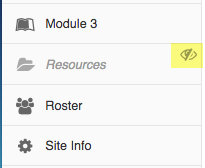 But instructors see the tool as gray and italicized with a "hidden" icon to the right of the tool. Locking access to a tool disables it for student use. Students will not see it in the menu, and they also will not be able to access that tool from other areas of the site. Click the gear icon to go to the tool settings. Then, select Lock Access to this Tool from the drop-down menu. Note: Not all tools are lockable. If the tool cannot be locked, that option will not appear in the drop-down menu. Locked tools are indicated by a "padlock" icon Tool Order list. In this example, the Calendar tool is locked with a padlock icon to the right of the tool. Locked tools are hidden by default in the site Tool Menu. In this example, the Calendar tool is both hidden and locked. Instructors see the tool as gray and italicized with a "hidden" icon to the right of the tool, but students do not have access to the tool so they do not see it in the menu at all. Deleting a tool has the same affect as removing a tool using the Manage Tools option in Site Info. It will remove the tool from the menu and deactivate it in the site, but it will not delete any content that exists within the tool. Click the gear icon to go to the tool settings. Then, select Delete this Tool from the drop-down menu. Note: Not all tools can be deleted. If the tool cannot be deleted, that option will not appear in the drop-down menu. Once you have completed all of your changes, click the Save button at the bottom of the list. Prev: How do I add tools to my site? Next: How do I add users to my course or project?